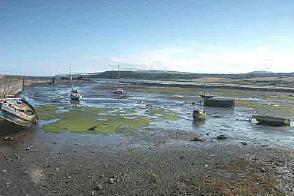 Maidens village (NS 21 08) has an attractive harbour much of which dries out at low tide and a foreshore with good feeding for birds. There is a large free car park overlooking the harbour. All the birding is within an easy walk of here. There is also plenty of parking overlooking the beach along Maidens shore road. Buses along the coast by Maybole are regular. Access by cycle is easy and safe from and to Culzean Country Park but take due care if using the main A719 coastal road to Maidens. Disabled parking. View harbour from car park, foreshore from grassed area but note this area is also used for dog-walking. The good combination of rocky promontory, coastal mudflat and sandy beach backed by marram grass attracts a wide range of passage and wintering birds, notably seabirds and waders. The rocky shoreline to the south of Maidens and towards Turnberry point is a Site of Special Scientific Interest. Redshank, Dunlin, Golden Plover, Eider, Shelduck and a range of gulls are common. 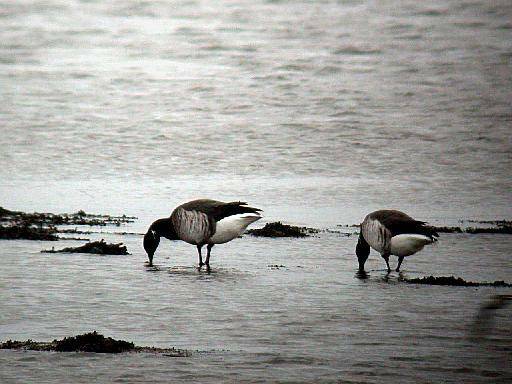 Curlew Sandpiper and Water Pipit have been recordedand pale-bellied Brent Geese have been over-wintering in recent years. An offshore scan may be rewarded with interesting passage and wintering seabirds including Red-throated, Black-throated and Great Northern Diver and Great Crested and Slavonian Grebe . The rough ground adjoining the beach is good for flocks of Linnet, Greenfinch, Goldfinch , etc. A family party of Otters was seen playing on the sea from the headland during the New Year Bird Race in January 2002. Maidens has a good range of catering possibilities ranging from picnicking (with toilets nearby) by the beach to eating in some of the best restaurants in Ayrshire. This entry was posted in Locations - South Ayrshire on 01-Mar-2003 .